The packed-bed basket technology, developed by New Brunswick Scientific (acquired by Eppendorf Inc. in 2007), provides a shear free environment for production of animal cells. At present, little information is available on the utility of the New Brunswick CelliGen® BLU singleuse bioreactor system for the production of secreted proteins, especially in perfusion mode of operation. Thus, this study was conducted to measure the growth and productivity of alkaline phosphatase (ALKP)-secreting rCHO. 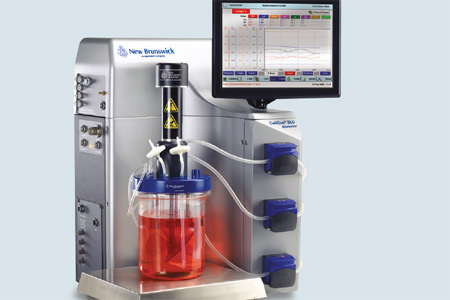 Two packed-bed bioreactor types were used: 5 L New Brunswick CelliGen® BLU single-use vessel and 2.5 L autoclavable glass vessel both operated by New Brunswick CelliGen® 310 console in perfusion mode. The perfusion process provides a homeostatic environment for optimal cell growth similar to that experienced by cells in vivo, where waste products are constantly removed and fresh nutrients are replenished. Cells cultured in packed-bed bioreactors are not exposed to hydrodynamic forces, thus, allowing for maximum cell growth and protein expression1. The objective of this study was to compare the two types of bioreactors to determine if any differences are observed between the productivity of the two bioreactors.